Synchronised swimming – So much more than a nose clip and a smile! 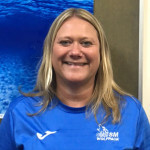 As someone who has been a synchronised swimmer for many years and now a coach and a judge, when I’m asked why I am still involved, the main reason I would give is simply that it’s so much fun! ‘Synchro’ offers all the benefits of swimming but in my opinion it is much more diverse, in terms of content. It incorporates gymnastic and dance skills, musicality and rhythm. Obviously, you also need to be a strong swimmer, be happy underwater, upside down and spinning around! Swimmers (and their teams) are judged on synchronisation which is an obvious one but also on artistic impression which includes the smiles and facial expression as well as manner of presentation, choreography, interpretation of the music, technical difficulty and execution. The best synchro swimmers train full time with a mix of land and in water training. Land based training includes strength and conditioning, flexibility and dance. In the water synchro swimmers focus on regular swimming and building stamina, synchronised swimming technical skills, choreography and routine skills. If you think it is simple have a look at the effort going on under the water! Synchro swimmers just make it look easy!